Research Professor. Electrical and Computer Engineering Dept. University of New Mexico Albuquerque, NM 87131-001 USA. Fernando joined the faculty of the School of Telecommunications Engineering, University of Vigo, as an assistant professor in 1990 and since 2000 is Professor (Catedrático) in the same institution. During 2009-2012 he was the holder of the Prince of Asturias Endowed Chair on Information Science and Technology at the University of New Mexico (UNM), where he currently is Research Professor. During 2007-2014 he was Founding Executive Director of GRADIANT (Galician R&D Center in Advanced Telecommunications), a private-public R&D center with a staff of more than 80. He was coeditor of the book Intelligent Methods in Signal Processing and Communications (Boston, MA: Birkhauser, 1997), has been Guest Editor of three special sections of the EURASIP journal Signal Processing devoted to signal processing for communications and digital watermarking, as well as Guest Editor of a Feature Topic of the IEEE Communications Magazine on digital watermarking. He has been Technical Program Committee Co-Chair of the 10th-15th International Workshops on Digital Forensics and Watermarking (IWDW), the 2013 IEEE International Workshop on Multimedia Signal Processing (MMSP'13), and the 7th IEEE Workshop on Information Forensics and Security (WIFS2015). Fernando was the Chair of the 5th and 6th Baiona Workshops on Signal Processing in Communications, held in Baiona, Spain, in 1999 and 2003, respectively, and Co-Chair of the 7th Information Hiding Workshop, in Barcelona, Spain, 2005, the First Workshop on Applications of the Benford’s Law, in Santa Fe, NM, USA, 2007, the 4th IEEE Workshop on Information Forensics and Security, WIFS2012, in Tenerife, Spain, 2012, and the 4th ACM Workshop on Information Hiding and Multimedia Security, in Vigo, Spain, 2016. He has co-authored over 60 papers in leading international journals and more than 170 papers published in various conference proceedings. He led the group of the University of Vigo that took part in the European projects CERTIMARK and REWIND, the ECRYPT European Network of Excellence and currently participates in the European projects NIFTy and WITDOM. He has also been the representative for the Spanish Ministry of Science and Innovation in the European Research Area CHISTERA. During 2007-2010 he was Program Manager of the Spanish National R&D Plan on Electronic and Communication Technologies, Ministry of Science and Innovation, where he oversaw an annual budget of over 21 M€. Fernando served as Associate Editor of IEEE Signal Processing Letters (2005-2009) and IEEE Trans. on Information Forensics and Security (2006-2010). Currently, he is Associate Editor of the LNCS Transactions on Data Hiding and Multimedia Security. Since October 2017 he is Editor in Chief of EURASIP International Journal on Information Security. He was an Elected Member of the Information Forensics and Security Technical Committe, IEEE Signal Processing Society, in the periods 2010-2012, 2015-2017; and an Eelected Member of the Special Area Team in Biometrics, Data Forensics and Security, EURASIP, during 2016-2018. He is a Fellow of the IEEE. Ingeniero de Telecomunicación, Universidade de Santiago, 1990. PhD Telecommunications Engineering, Universidade de Vigo, 1993. A. Pedrouzo-Ulloa, M. Masciopinto, J.R. Troncoso and F. Pérez-González. Camera Attribution Forensic Analyzer in the Encrypted Domain. 10th IEEE International Workshop on Information Forensics and Security, WIFS 2018, Hong-Kong, December 2018. Best Paper Award. P. Comesaña and F. Pérez-González. The Optimal Attack to Histogram-based Forensic Detectors is Simple(x). 6th IEEE International Workshop on Information Forensics and Security, WIFS14, Atlanta, GA, December 2014. Best Paper Award. P. Comesaña, F. Pérez-González and C.T. Abdallah. Witsenhausen's Counterexample and its Links with Multimedia Security Problems. International Workshop on Digital-forensics and Watermarking, IWDW11, Atlantic City, New Jersey, October 2011. Best Paper Award. J. Elices, F. Pérez-González and C. Troncoso. Fingerprinting TOR's Hidden Service Log Files Using a Timing Channel. IEEE Intl. Workshop on Information Forensics and Security, WIFS'11, Foz de Iguazu, Brazil, November-December 2011. Gold Award to Best Student Paper. L. Pérez-Freire and F. Pérez-González, Spread Spectrum Watermarking Security, IEEE Transactions on Information Forensics and Security, 4(1):2-24, March 2009. Nominated by the IFS-TC (Information Forensics and Security Technical Committee) to the IEEE Signal Processing Society Young Author Best Paper Award. Member, Royal Galician Academy of Sciences, 2014. Engineer of the Year, Galician Official Association of Telecommunication Engineers, 2011. Cloud Innovation Award by Fujitsu, 2011. Eganet Award to e-Administration, 2010. Galician Official Association of Telecommunication Engineers Award to Best Product in Information and Communication Technologies, 2008. University of Santiago award to entrepreneurship, Bit Oceans, 2008.
fication of Research Activity (Spanish Ministry of Education and Science), 2006. GaliciaTIC 2005 Award to Digital Innovation. 2001 E.T.S.E.T. Award to Cooperation with Industry. MITE 2000 Award to entrepreneurship. Juan Ramón Hernández (1998), now at Nagra. Awarded best Ph.D. Thesis in Spain in Electronic Commerce by the Spanish Institute of Telecommunications Engineers, 1999. 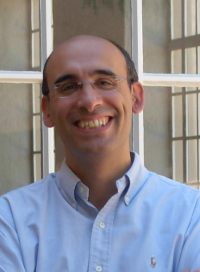 Roberto López-Valcarce (2000), Associate Professor (University of Vigo). Pedro Comesaña (2006), Associate Professor (University of Vigo). Awarded best Ph.D. Thesis in Spain in Security and Defense by the Spanish Institue of Telecommunications Engineers, 2007. Luis Pérez-Freire (2008), Executive Director (GRADIANT). Awarded best Ph.D. Thesis in Spain in Management, Economy and Regulation of Telecommunications by the Spanish Institute of Telecommunications Engineers, 2009. Juan R. Troncoso (2012), Postdoctoral Fellow (Ecole Polytechnique Federale de Lausanne). Awarded best Ph.D. Thesis in Spain in Telecommunication Networks and Services by the Spanish Institute of Telecommunications Engineers, 2013. Juan Antonio Elices (2014, at UNM), Researcher at Safe Browsing Group, Google, US. Gabriel Domínguez (2016), Research Scientist at Callsign, UK. David Vázquez Padín (2016), Senior Researcher (University of Vigo). Awarded best Ph.D. Thesis in Galicia by the Galician Institute of Telecommunications Engineers, 2018. My mathematical genealogy tree traces back to Fourier and Gauss!